The diamonds in this brooch were said to have been taken from the turban of Tipu Sultan after his death at the battle of Seringapatam in 1799, though if the provenance of the stones is correct, it is probably more likely that they came from his treasury. Tipu Sultan was the ruler of the south Indian state of Mysore, who fought against the British as they extended their control in southern India. Captain Cochrane, one of the British officers, is said to have received the gems when the turban jewels were divided. Captain Cochrane had them set in pieces of jewellery which he gave to his daughters. However, the brooch does not exactly match the description of it given by Mrs Agnes Chambers who later inherited it. 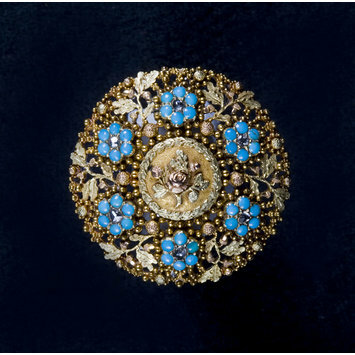 The brooch has rose, forget-me-not, oakleaf and acorn motifs. The rose motif presumably symbolises love while the oak would represent strength and longevity. These and the forget-me-nots may relate to the strand of hair in a locket in the back and it is possible that the brooch was intended as a wedding gift. The brooch is in the tradition of European romantic jewellery of the first half of the nineteenth century. 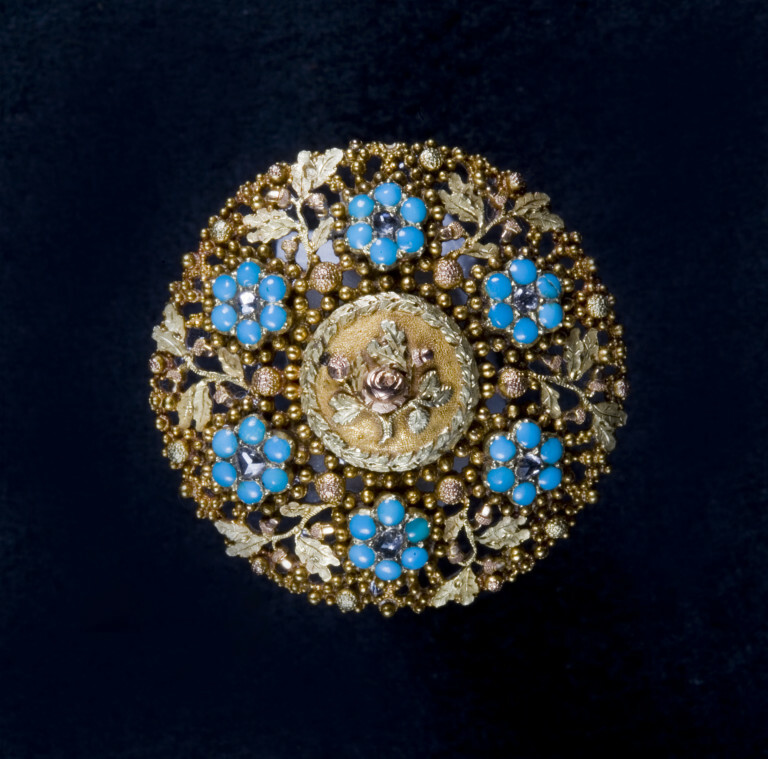 Brooch, gold set with diamonds and turquoises. The gems are set in six rosettes each with a diamond in the centre and six turquoises surrounding it, presumably representing forget-me-nots. These rosettes are on an openwork background of oak leaves and acorns, surrounding a circular plaque with a rose and oak leaves in relief. Near the rim, opposite the place where the pin protrudes from the brooch and slightly to the left, is a very small indentation with a mark in the shape of a ram's head. This is the restricted warranty mark for Paris, 1819-38. On the reverse there is a hinged pin and in the centre a locket with a hinged transparent cover (presumably glass) containing a strand of hair. The diamonds have been examined and are Golconda diamonds. They are relatively small at approximately 0.2 carats and are all roughly polished into rose-cut forms. One has a large red inclusion, probably a garnet, visible under magnification. Red inclusions are considered unlucky in traditional Indian gemmology, as noted by G.F.Kunz in 'The Curious Lore of Precious Stones' drawing on Buddhabhatta's treatise on gems. As there is the remnant of what may have been a hoop on the back at the top, it is possible that the object was originally made as a pendant, then converted into a brooch by removing the hoop and affixing a pin. The brooch was acquired with a letter dated Feb 18th 1878 which says: "My dear Agnes The accompanying brooch I herewith give you as a keepsake not only for its intrinsic value, but of its history - Coming to me as a Legacy through the Honble Mrs Cochrane, whose daughter was my charge for some years, & whose father the Honble Capt Cochrane an officer in the memorable battle of Seringapatam shared the jewels all of first class taken in the Turban of Tippo Said [sic] - Capt Cochrane had 3 valuable necklaces & 3 brooches made of the same, In India, for his three daughters! --The Brooch accompanying this, represents the Rose the Shamrock & the Thistle. The Brilliants being of the very first water. -- I should advise care in wearing the same the pin not being I consider safe. Should you at some future time be inclined to part with it, I would like you to consider it as a Heirloom to your eldest daughter. In such a fulfilment of my wish you have the power in future circumstances to decide . It pains me to use my hands with this attack of Rheumatism for which I make excuse in not writing all I wish. For Mrs Agnes Chambers, Norwood Park, Southwell, Notts." The brooch was inherited from Mrs Agnes Chambers by her daughter, Miss Margaret A. Chambers, of 5 Froyle House, Burridge Road, Torquay, who gave it to the museum in 1963. However, the plant motifs in the brooch - rose, forget-me-not, oakleaf and acorn - do not correspond exactly to those described in the letter. The brooch Western European, probably from Paris. The diamonds are from Golconda, India.